With its splayed legs and trestle base, this counter height table exudes charming farmhouse style. The table shape is casual, yet fun - the farmhouse look enhanced by the lightly distressed brown finish. The Vernon Dining Counter Height Table with Angled Legs by Rooms Collection One at Rooms Furniture in the Houston, Sugar Land, Katy, Missouri City, Texas area. Product availability may vary. Contact us for the most current availability on this product. Case Detail Trestle bases, x-backs. 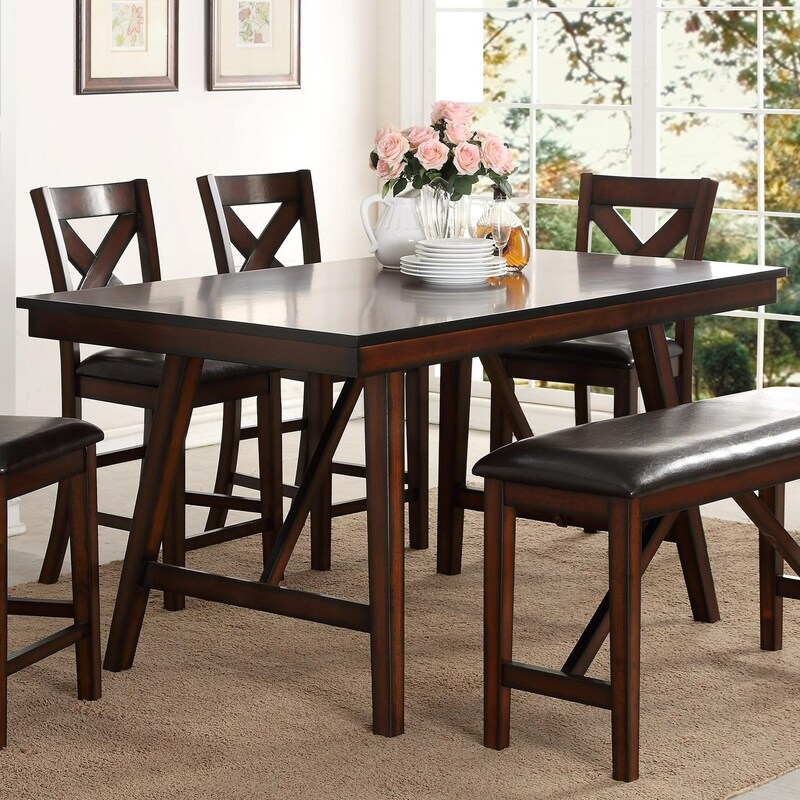 Add this counter height dining set to your home for a casual farmhouse look. Trestle bases, x-backs on chairs, and lightly distressed brown finish all speak to rustic farmhouse style, while easy-to-clean upholstered seats provide modern convenience and comfort. Sitting at counter height with a dining bench option, this dining set presents a fun alternative to a traditional dining set. The Vernon Dining collection is a great option if you are looking for Transitional Casual furniture in the Houston, Sugar Land, Katy, Missouri City, Texas area. Browse other items in the Vernon Dining collection from Rooms Furniture in the Houston, Sugar Land, Katy, Missouri City, Texas area.